“IN THE LOW-SLUNG hills of El Salvador, building a house is not an easy task. The land is vulnerable to earthquakes, flooding, volcanic eruptions. The roads are rugged, electricity sparse. For the past several years, New Story—a housing charity based in San Francisco—has built over 150 homes there, replacing tarps and scrap metal shelters with houses that have proper roofs and floors. It’s slow, painstaking work in a country where nearly a third of the population is without shelter. The idea they landed on: 3-D printing. For the past 10 months, New Story has tinkered away with construction technology company ICON to design a 3-D printer for building homes in regions of the world that lack the economic resources to house their poorest citizens. Today, the companies are showing off the fruits of their labor: a 350-square-foot structure in Austin, Texas, and the first 3-D-printed house in the country built to local housing code. The Texas house is just a prototype of the fast, cheap, and sustainable home design the company hopes to bring to El Salvador, Bolivia, Haiti, and Mexico. Using current traditional methods, it takes New Story eight months to build a community of 100 homes, which cost about $6,000 each. 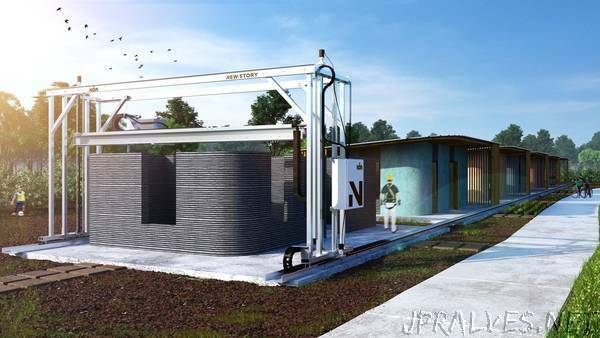 With a 3-D printer, it says it can build one home a day at a cost of $4,000 per structure. If New Story succeeds, the first people to live in a 3-D-printed town won’t be the technologists or the futurists of Silicon Valley. They’ll be people in the world’s poorest regions, who most need a roof over their heads. A decade ago, when 3-D printing promised to usher in a second industrial revolution, many saw the potential of using 3-D printers to make buildings. An architect could make a tiny model of a new home design using the resin or plastic filament in a desktop 3-D printer, then employ a similar but much larger machine to spit out a life-size version of that same design using concrete and other familiar building materials. The method looked to be cheaper and faster than traditional building, and it used fewer resources—you only print the materials you need, down to the drop. In 2013, the world of 3-D-printable buildings belonged to WinSun, a Chinese construction company that successfully printed 10 houses in a day with a proprietary mix of cement, sand, and recycled materials. It would later 3-D print a six-story apartment, an office building, and a 11,000-square-foot mansion. (The company also suggested it could 3-D print Donald Trump’s border wall between the US and Mexico.) Since then, other companies have joined the race to print buildings, creating tiny houses and apartments and treehouses with specialized 3-D printers that extrude mortar like an inkjet. Critics worry that these companys, like all the others in the 3-D-printing space, will have difficulty scaling up. But New Story’s Lafci doesn’t want to wait for the technology to trickle down to the regions with lean economies. “It will take many years before 3-D-printed homes are printing the types of homes that you and I would live in, but the tech is ready now to print very high-quality, safe homes in the places we’re building,” she says. By the time New Story partnered with ICON, the company had already made a few 3-D-printer prototypes that could spit out tiny houses. But those were built for a warehouse setting. The printer for New Story needed to withstand rugged conditions, bad weather, and the occasional power outage while it printed outdoors. It also had to be portable enough to move around in a country without good transportation infrastructure. ICON built a gantry-style printer out of lightweight aluminum, with a built-in backup generator. It also designed a proprietary building mix to suit New Story’s requirements. The mortar had to be thin enough to flow through the printer like ink, but thick enough to set in the shape of the building. It had to cure relatively quickly, but not too fast, or the next layer wouldn’t fuse properly. “If you just had stacks of cured layers, then you could just push it over like a stack of Dominos,” says Ballard. New Story added an additional requirement: No exotic materials, nothing that had to be imported. Lastly, the company created a 3-D-printing software suite that would allow communities to customize houses to their specific needs. When it came time to test the printer in Austin, Ballard says there were a few surprises. The concrete pump kept getting stuck, and heavy rain in Austin jammed up a few parts. “We had to clean it, like, every eight layers,” says Ballard. “Just stop, clean.” But eventually, the house was printed, and the finished structure met all of Austin’s permitting standards.